Approached by the Client in late 2014, our firm presented a proposal in March 2015 and was awarded the commission in a limited competition. 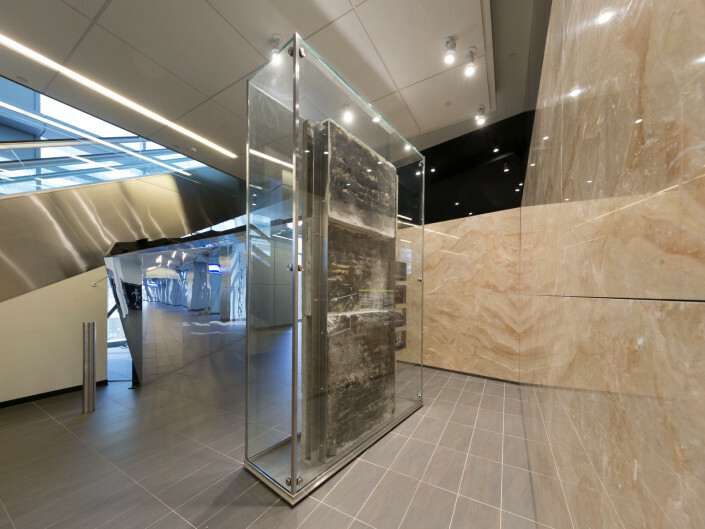 The Client’s brief was to one, insert the limestone slabs containing the artwork into the highly trafficked, publicly accessible, above grade PATH system under the back of an escalator at the end of a long corridor view; and two, include an interpretive display regarding the history of the original early modern office building on the site of the development. 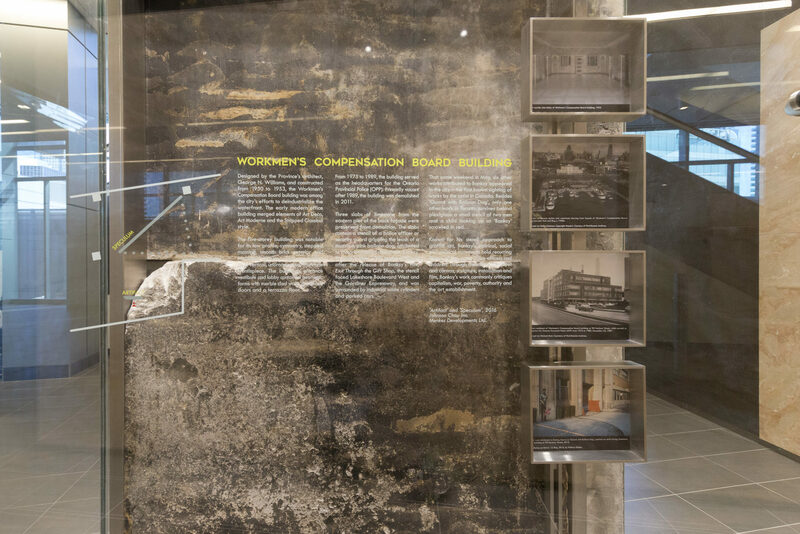 The design concept for the installation is to one, evoke the past by acknowledging the architectural history of the original 1950s building, not just by interpretative panels but by engaging at subconscious levels of experience; two, define views and movement and consider appropriate solutions for interpretative elements in a highly trafficked area; and three, create an immersive and interpretative installation, where the installation is an opportunity to enhance one’s experience of comprehending the original building through analogous elements. 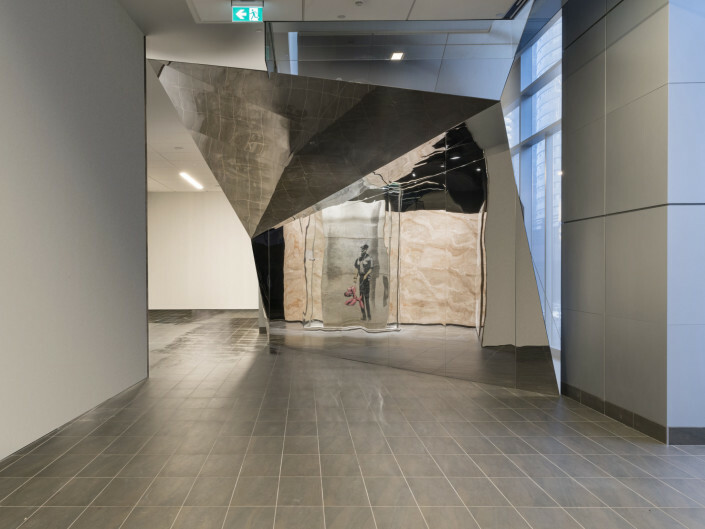 As an ensemble installation, Artifact and Speculum are designed to engage one by heightening one’s act of viewing a preserved fragment (Artifact) through an ‘apparatus for viewing’ (Speculum). 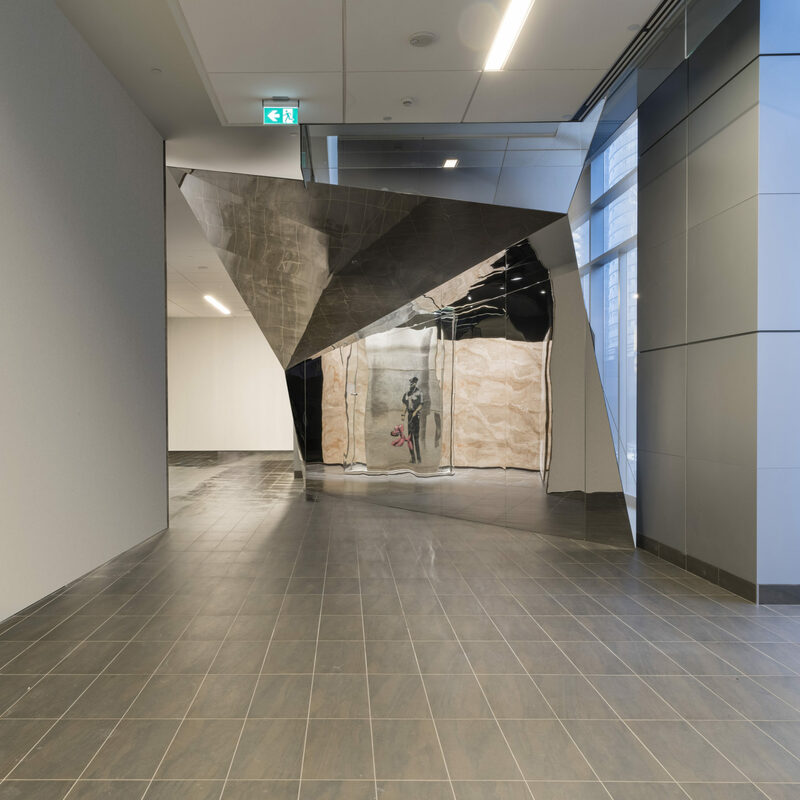 As one rounds the corner and walks west along the 2nd level PATH, one has a long view (200 feet) of Speculum – an angled, mirrored, folded plane – that not only guides one around the underside of the escalator, but reflects what is to come around the corner: Artifact. 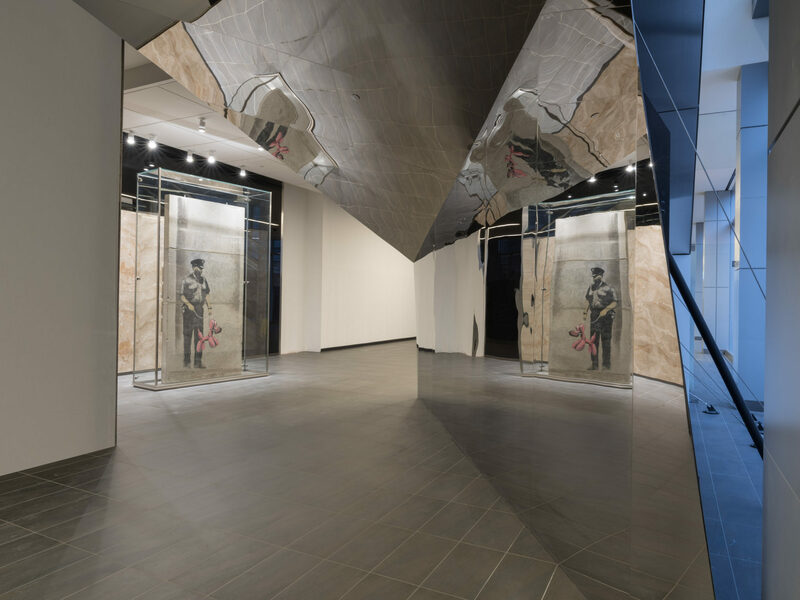 Speculum is a reference to the latin derivation of spec, to look or behold, and ulum, an instrument: an instrument to behold. 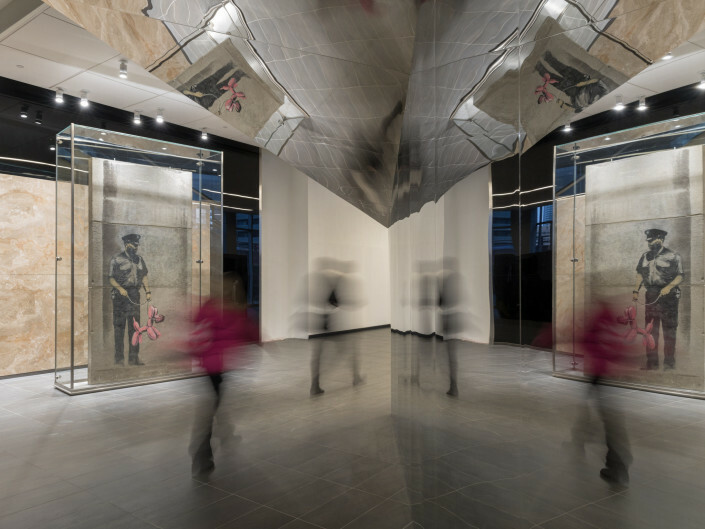 The reflected image is intentionally distorted, creating an ‘apparition’ of the stencil and underscoring the notion of the ephemerality of street art. 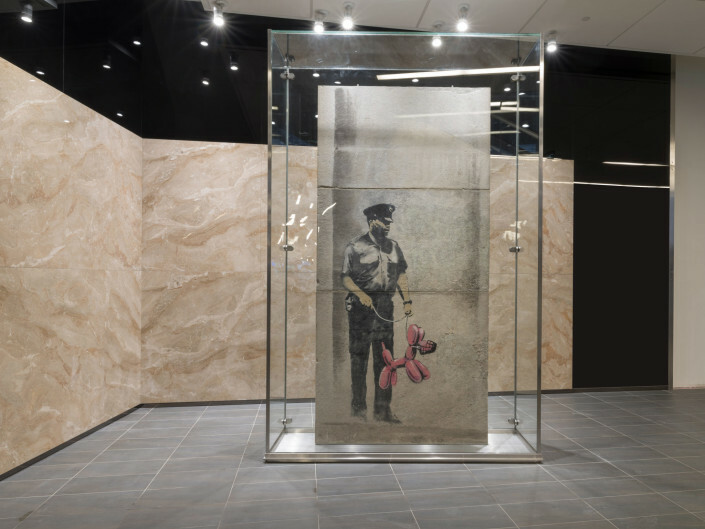 Should its temporality have been accepted and preserved in photographs and memory, as an artifact of a moment in time? 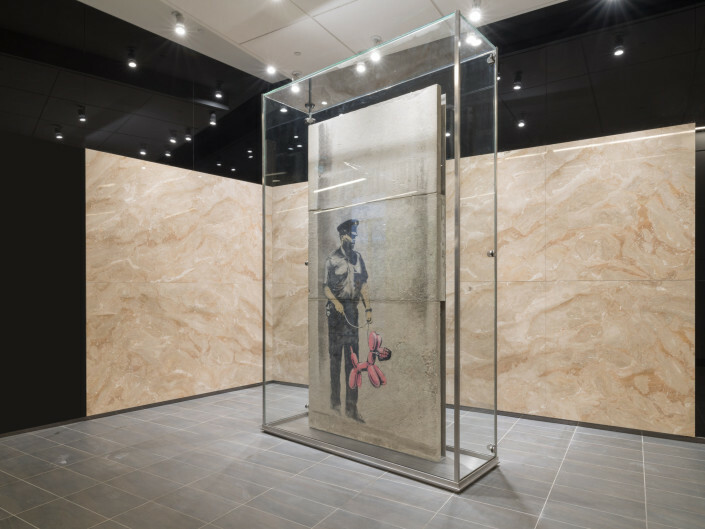 In the ‘recess’, three limestone slabs containing a work attributed to the anonymous British artist, Banksy, sit in their raw form. 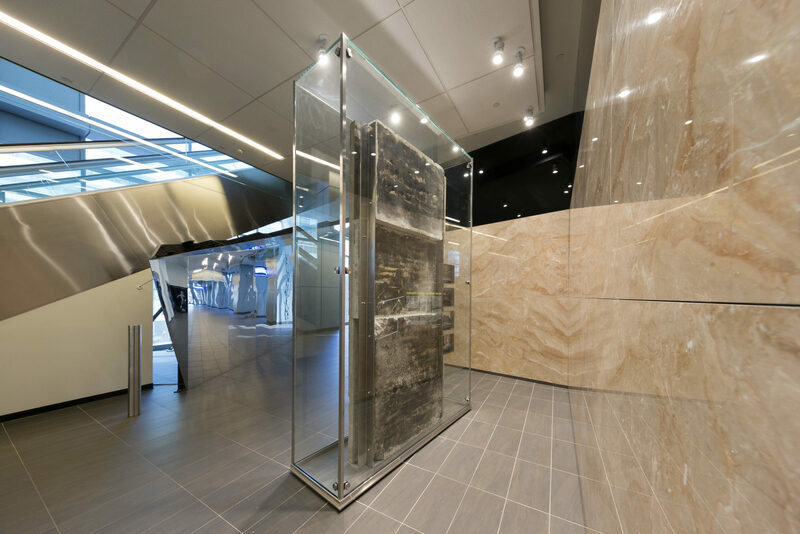 Extracted from the original building’s back facade, the slabs are set off from a marble clad wall that not only evokes the lobby and horizontality of the original 1950s office building, but draws passersby around the back of the work. 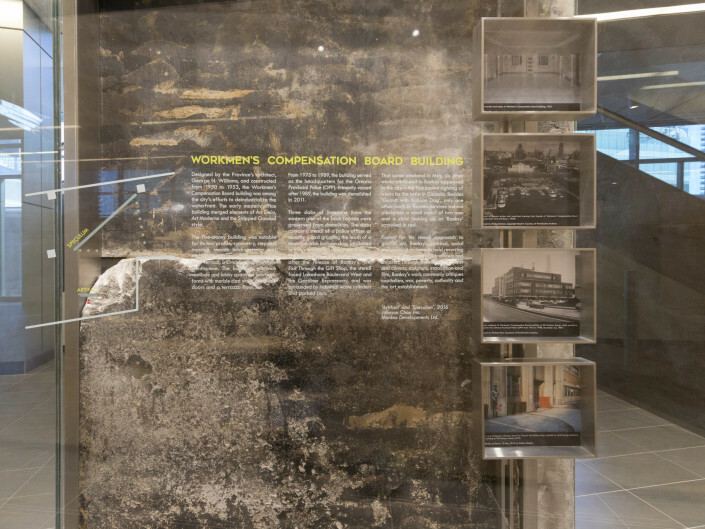 By creating a space away from the flow of pedestrian traffic, one is able to view an interpretative panel on the history of the building at one’s leisure.